While his students are pushing their limits, Tran is shifting the rhythm of Reed’s dance department, in his role as visiting assistant professor. 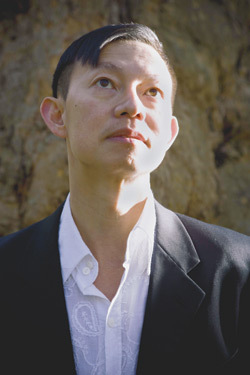 For more than two decades, as performer, choreographer, and teacher, Tran has been crossing—and blurring—borders, merging traditional Southeast Asian dance techniques with contemporary Western expressions, and captivating audiences in Portland and beyond. Along the way, the national-award winner has caught the attention of critics and peers who applaud him as one of the most impressive modern dancers in the contemporary scene. He has taught at Reed since Sept­ember 2008, thanks to a $1.5 million grant from the Andrew W. Mellon Foundation and nearly $4.5 million in gifts from alumni and friends to expand and support faculty in theatre, music and dance departments. Dance has been an integral part of Reed since 1958, when the world-renowned Trisha Brown taught the college’s first courses in modern dance. The arrival of Judy Massee, who served as director from 1968 to 1998, heralded a new era for the discipline at Reed. “She’s the one who really built the department that we have now,” says dance professor and current director Patricia Wong, who was hired in 1975 and is retiring this summer. She and Carla Mann ’81, visiting professor since 1995, are thrilled that Tran has joined the department. Maybe that’s because Tran has taken a close look at his own life. The last of eight children, he was born in 1966 to peasant parents who fled North Vietnam for the outskirts of Saigon (now Ho Chi Minh City). By age 4, “rich and spoiled” from his father’s lottery win, he was living in a four-story house with a ballroom and spiral staircase, in Saigon’s bustling downtown. The Confucian bedtime stories his father told him came to life for Tran in the live classical Vietnamese opera performances the two of them enjoyed; and by age 7, he was training in that tradition at the National School of Fine and Performing Arts.